Soybean [Glycine max (L.) Merr.] is an important crop for vegetable oil production, and is a major protein source worldwide. Because of its importance as a crop, genetic transformation has been used extensively to improve its valuable traits. Soybean mosaic virus (SMV) is one of the most well-known viral diseases affecting soybean. Transgenic soybean plants with improved resistance to SMV were produced by introducing HC-Pro coding sequences within RNA interference (RNAi) inducing hairpin construct via Agrobacterium-mediated transformation. During an experiment to confirm the response of transgenic plants (T2) to SMV infection, no T2 plants from lines #2 (31/31), #5 (35/35) or #6 (37/37) exhibited any SMV symptoms, indicating strong viral resistance (R), whereas NT (non-transgenic wild type) plants and those from lines #1, #3 and #4 exhibited mild mosaic (mM) or mosaic (M) symptoms. The northern blot analysis showed that three resistant lines (#2, #5 and #6) did not show the detection of viral RNA accumulation while NT, EV (transformed with empty vector carrying only Bar) and lines #1, #3 and #4 plants were detected. T3 seeds from SMV-inoculated T2 plants were harvested and checked for changes in seed morphology due to viral infection. T3 seeds of lines #2, #5 and #6 were clear and seed coat mottling was not present, which is indicative of SMV resistance. RT-PCR and quantitative real-time PCR showed that T3 seeds from the SMV-resistant lines #2, #5 and #6 did not exhibit any detection of viral RNA accumulation (HC-Pro, CP and CI), while the viral RNA accumulation was detected in SMV-susceptible lines #1, #3 and #4 plants. During the greenhouse test for viral resistance and yield components, T3 plants from the SMV-inoculated transgenic lines #2, #5 and #6 showed viral resistance (R) and exhibited a more favorable average plant height, number of nodes per plant, number of branches per plant, number of pods per plant and total seed weight with statistical significance during strong artificial SMV infection than did other plant lines. In particular, the SMV-resistant line #2 exhibited superior average plant height, pod number and total seed weight with highly significance. According to our results, RNAi induced by the hairpin construct of the SMV HC-Pro sequence effectively confers much stronger viral resistance than did the methods used during previous trials, and has the potential to increase yields significantly. Because of its efficiency, the induction of RNAi-mediated resistance will likely be used more frequently as part of the genetic engineering of plants for crop improvement. The online version of this article (doi: 10.1007/s11816-016-0402-y) contains supplementary material, which is available to authorized users. Soybean [Glycine max (L.) Merr.] is a major crop that produces the best vegetable oil and protein for use in food and beverage production worldwide. Because of its importance as a crop, genetic transformation techniques have been used extensively to improve the crop’s valuable traits (Zeng et al. 2004; Seo et al. 2009). Soybean mosaic virus (SMV), a member of the family Potyviridae, which has a positive-sense-stranded RNA genome of approximately 10 kb, is one of the most well-known viral diseases affecting soybean. The symptoms of SMV infection in soybean plants and seeds include the presence of a mosaic pattern on the plant’s leaves, leaf curling, necrosis, chlorosis and seed mottling. In particular, infected soybean plants may result in yield losses because of the noticeable reduction in the number of seeds produced by infected plants (Seo et al. 2009; Cho and Goodman 1979; Steinlage et al. 2002; Hobbs et al. 2003; Gunduz et al. 2004). The transmission of SMV occurs in soybean fields because not only does the virus spread from parent to progeny, it also spreads via the movement of more than 30 different kinds of aphid species, which may lead to secondary spreading of the virus (Steinlage et al. 2002; Hill et al. 1980; Halbert et al. 1981; Jagtap et al. 2011). Improving the genetic resistance of soybean cultivars has been considered the most effective means of managing SMV damage to soybean plants. Three independent SMV-resistant (R) gene loci, including Rsv1, Rsv3 and Rsv4, have been identified in soybean cultivars PI 96983, L29 and V94-5152, respectively. These loci may confer resistance to the disease caused by seven SMV strains (G1-G7). Rsv1, Rsv3 and Rsv4 are resistant to strains G1–G6, G5–G7 and G1–G7, respectively (Gunduz et al. 2004; Lim 1985; Hayes et al. 2000; Zheng et al. 2006; Gagarinova et al. 2008). Using conventional breeding methods to produce SMV-resistant cultivars is a laborious and time-consuming procedure, and is often accompanied by the introgression of undesirable traits via the cross. To overcome the limitations of conventional breeding, genetic transformation can be a good method of improving virus resistance in soybean (Jagtap et al. 2011; Furutani et al. 2006; Kim et al. 2013; Gao et al. 2015). Soybean transgenic plants with various useful genes have been developed using Agrobacterium-mediated transformation system based on the cotyledonary-node (CN) method (Hinchee et al. 1988). Recently, the system has been improved and simplified by incorporating the use of half-seed explants (Paz et al. 2006). Using additional treatments, such as a mixture of thiol compounds, sonication and a vacuum resulted in positive improvements in transformation efficiency (Meurer et al. 1998; Olhoft et al. 2003). Plants have evolved to resist viral invasion. RNA silencing is known to be an adaptive antiviral mechanism that protects plants against viral infection. Plant viruses have a RNA-based genome and are known inducers of RNA silencing and targets of posttranscriptional gene silencing (PTGS) (Jagtap et al. 2011; Roth et al. 2004; Rahman et al. 2008; Soitamo et al. 2011). However, several viruses encode proteins that suppress RNA silencing. Helper-component proteinase (HC-Pro), a potyvirus RNA silencing suppressor, is a multifunctional protein encoded by plant viruses and involved in different steps of the viral infection cycle, replication, aphid transmission and viral systemic and cell-to-cell movement in plants. Remarkably, HC-Pro has been identified as a suppressor of PTGS that prevents silencing by blocking the accumulation of siRNAs and enhances the accumulation of heterologous viruses (Roth et al. 2004; Kasschau and Carrington 2001; Mlotshwa et al. 2002; Plisson et al. 2003; Lim et al. 2005). Because of the efficiency of its RNA interference (RNAi), it is one of the most exciting biotechnological approaches to the functional analysis of genes and antiviral mechanisms (Rahman et al. 2008; Matthew 2004; Tenllado et al. 2004). The resistance of papaya, plum, cassava, bean, sugar beet, tobacco, rice, tomato, etc. to viruses is produced by RNA-mediated silencing (Frizzi and Huang 2010). A non-bruising trait can also be introduced via the same strategy, when the reduction of polyphenol oxidase is induced by RNAi (Okanagan Specialty Fruits Inc., Canada, 2014). Therefore, RNAi is an important tool for knocking down targeted genes and silencing specific plant traits. If viral diseases affecting plants can be controlled, crop plants can be protected from the damage caused by viruses and insects (Jagtap et al. 2011; Matthew 2004; Tenllado et al. 2004). In our previous study, most transgenic lines transformed with SMV-CP using RNAi were susceptible to SMV. Only a few plants exhibited SMV resistance in the T1 generation. In addition, resistance decreased continuously in the successive generation (Kim et al. 2013). To improve resistance against SMV, we produced new transgenic soybean plants by introducing HC-Pro coding sequences within a RNAi inducing hairpin construct via Agrobacterium-mediated transformation system, and examined their response to viral infection. The inhibition of HC-Pro expression enhanced viral resistance after viral infection, compared to the resistance of virus-susceptible non-transgenic plants. HC-Pro gene of SMV strain G7H was provided by Dr. K.H. Kim (GenBank: AY294045.1, Seoul National University, Korea) and a partial fragment of 306 bp (Fig. 1a) was amplified by PCR using HC-Pro-F primer (5′-CACCATGCCTCCTAATGTGGAGAA-3′) and HC-Pro-R primer (5′-ACGCACAATCTCCAGTGATGTCTG-3′). The plasmid, pB7GWIWG2(I)-HC-Pro (Fig. 1b) was constructed and transformed into Agrobacterium tumefaciens strain EHA105 (Karimi et al. 2002), following the protocol described by Kim et al. (2013). Seeds were prepared using mature soybean seeds of Korean cultivar Kwangan. Soybean seeds were sterilized for 20 h using chlorine gas produced by mixing 5 mL of 12 N HCl and 95 mL of 12 % sodium hypochlorite in a tightly sealed desiccator (Paz et al. 2006; Di et al. 1996). One day before inoculation, 100–120 seeds were surface sterilized again using 1 % sodium hypochlorite mixed with Tween 20 by Tube Tumbler Rotating Mixer (Select BioProducts, USA) and soaked in distilled water overnight at room temperature. Previously prepared Agrobacterium stock (1 mL) was cultured in 200 mL liquid YEP medium containing 50 mg L−1 spectinomycin and 25 mg L−1 rifampicin for 20 h at 28 °C, 250 rpm until OD600 reached between 0.6 and 0.8. For inoculation, Agrobacterium culture was centrifuged for 15 min at 20 °C, 7000 rpm. The cell pellet was re-suspended in 15 mL liquid CCM (Co-Cultivation Medium) containing 0.32 g L−1 B5 salt with B5 vitamins, 4.26 g L−1 MES, 3 % sucrose, 1.67 mg L−1 6-BA, 0.25 mg L−1 GA3, 0.2 mM acetosyringone, 3.3 mM l-cysteine, 1.0 mM sodium thiosulfate and 1.0 mM DTT, pH 5.4. The 15 mL liquid CCM was also used as a dipping solution. The cotyledons were separated by a longitudinal cut, and the seed coat was removed. The embryonic axis found at the junctions between the hypocotyl and the cotyledon was excised to obtain the half-seed explant (Paz et al. 2006) and the junction area was wounded eight times using a No. 11 scalpel blade (Feather, Japan), and then treated with the dipping solution. About 50 half-seed explants were immersed in 15 mL Agrobacterium suspension, treated with sonication for 20 s and a vacuum for 30 s, then inoculated for 30 min at room temperature. After inoculation, explants were placed adaxial side down on CCM containing 5 g L−1 agar overlaid with filter paper (Advantec, Japan). The co-cultivation was continued for 5 days at 24 °C under an 18 h photoperiod. After 5 days of co-cultivation, half-seed explants were briefly washed in liquid SIM (Shoot Induction Medium) containing 3.2 g L−1 B5 salt with B5 vitamins, 0.6 g L−1 MES, 3 % sucrose, 1.67 mg L−1 BA, 250 mg L−1 cefotaxime, 100 mg L−1 ticarcillin and 50 mg L−1 vancomycin for 10 min. The explants were embedded in SIM containing 5.4 g L−1 agar with the flat side up. Shoot induction was carried out for 14 days at 24 °C under an 18-h photoperiod in a tissue culture room. Explants were also transferred to fresh SIM containing 10 mg L−1 DL-phosphinothricin (PPT) for 14 days. After 4 weeks of shoot induction, explants were transferred to SEM (Shoot Elongation Medium) containing 4.4 g L−1 MS salt with B5 vitamins, 0.6 g L−1 MES, 3 % sucrose, 5.4 g L−1 agar, 0.5 mg L−1 GA3, 50 mg L−1 asparagine, 100 mg L−1 L-pyroglutamic acid, 0.1 mg L−1 IAA, 1 mg L−1 zeatin riboside, 250 mg L−1 cefotaxime, 100 mg L−1 ticarcillin, 50 mg L−1 vancomycin and 5 mg L−1 PPT, pH 5.6. Explants were transferred to fresh SEM every 2 weeks, and brown parts of shoots were cut using a No. 15 scalpel blade. During the shoot elongation, elongated shoots were cut using a No. 11 scalpel blade, dipped in 1 mg L−1 IBA for 3 min, then transferred to RM (rooting medium) containing 4.4 g L−1 MS salt with B5 vitamins, 0.6 g L−1 MES, 3 % sucrose, 4.4 g L−1 agar, 25 mg L−1 asparagine, 25 mg L−1 L-pyroglutamic acid, 50 mg L−1 cefotaxime, 50 mg L−1 ticarcillin and 50 mg L−1 vancomycin, pH 5.6. Rooted plantlets were rinsed with water to wash off the agar medium and transplanted to soil containing a mixture of Biosoil (Hongnong Horticulture, Korea) and vermiculite in a ratio of 3:1 in a magenta jar (SPL, Korea) for 1–3 weeks. T0 plants were then transplanted to large pots and grown in a greenhouse. 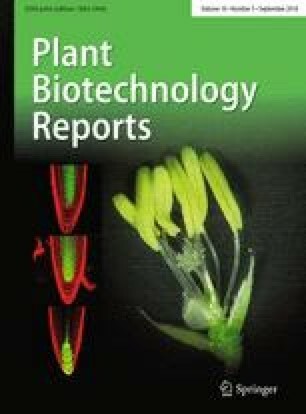 An herbicide assay was used to determine resistance by screening T0 plants with two trifoliates to identify putative transformants that expressed Bar. The upper surface of a leaf was painted across the midrib using a brush with 100 mg L−1 PPT mixed with Tween 20. The response to the herbicide was observed at 3–5 days after PPT painting. Twenty T0 plants resistant to PPT were grown in a greenhouse and seeds were harvested. Polymerase chain reaction (PCR) analysis was conducted to detect the introduced gene in NT and transgenic plants. Total genomic DNA was extracted using cetyltrimethylammonium bromide. To identify plants with HC-Pro insertion, the DNAs between HC-Pro (forward primer, 5′-GCAGCGGCAATAAGCCAGTCAATT-3′) and the intron (reverse primer, 5′-TGATGGCCATAGGGGTTTAGATGC-3′) and between the intron (forward primer, 5′-GCATCTAAACCCCTATGGCCATCA-3′) and HC-Pro (reverse primer, 5′-GCAGCGGCAATAAGCCAGTCAATT-3′) were amplified. Bar (forward primer, 5′-ATGAGCCCAGAACGACGCCC-3′ and reverse primer, 5′-TCAGATTTCGGTGACGGGCA-3′) and DNA from the left border (LB) to Bar (forward primer, 5′-TGGCTGGTGGCAGGATATATTGTG-3′ and reverse primer, 5′-AGACAAGCACGGTCAACTTCCGTA-3′) were also amplified. PCR was performed using KOD FX polymerase (TOYOBO, Osaka, Japan) according to the manufacturer’s instructions. The PCR reactions were conducted using a thermal cycler (Bio-Rad, USA). For the Southern blot analysis, 15 μg of genomic DNA from NT and transgenic plants were digested overnight by HindIII, fractionated on 0.8 % agarose gel by electrophoresis, then transferred onto Hybond N + nylon membrane (Amersham Pharmacia, USA). Hybridization, washing and detection were performed with a digoxigenin (DIG)-labeled DNA probe and a chemiluminescence system (Roche, Germany), according to the manufacturer’s instructions. The DIG-labeled probe was prepared via PCR amplification with the Bar forward primer (5′-AACTTCCGTACCGAGCCGCA-3′) and Bar reverse primer (5′-TCGTAGGCGTTGCGTGCCTT-3′). Quantitative real-time PCR (qRT-PCR) analysis was used to count the transgene insertion events and performed using the CFX-96™ Real-Time system (Bio-Rad, Hercules, CA, USA). Each reaction contained 4 μL of 3.3 ng μL−1 DNA, 1 μL of mixture of 5 pm μL−1 forward primer (5′-AACTTCCGTACCGAGCCGCA-3′) and 5 pm μL−1 reverse primer (5′-TCGTAGGCGTTGCGTGCCTT-3′), 5 μL of water and 10 μL of iQ™SYBR® Green Supermix (Bio-Rad, Ca, USA), for a total volume of 20 μL. The amplification conditions were as follows: 95 °C for 3 min, 40 cycles of 10 s at 95 °C and 30 s at 60 °C, then 95 °C for 10 s, followed by the generation of a dissociation curve by increasing the temperature from 65 to 95 °C, to check amplification specificity. A homozygous transgenic plant already confirmed to have a single Bar gene introgression was used as a single copy control. For virus inoculation, soybean leaves infected with SMV strain G5 were ground in 0.1 M phosphate buffer, pH 7.2 (1 g leaf tissue: 1.5 mL buffer) with a mortar and pestle, and the resulting suspensions were used as source of inoculums for virus inoculation. Selected seeds of NT, EV and transgenic plants were germinated in soil, and the first leaves of 7-day-old seedling were gently rubbed with Carborundum (Nacalai Tesque, 600 mesh) to wound the surface, then inoculated with a suspension. Inoculated leaves were gently rinsed with water to remove Carborundum (Zeng et al. 2004, 2006). The viral symptoms of inoculated plants were evaluated every week for 4 weeks, and classified as follows: resistance (R), mild mosaic (mM) and mosaic (M) symptoms. The presence of viral symptoms in harvested seeds was also evaluated and classified as follows: clean seed (resistant, R), light seed mottling (mild mosaic, mM) and dark seed mottling (mosaic, M). For northern blot analysis, total RNA was isolated from viral resistant and susceptible leaves using the Plant RNA Purification Reagent (Invitrogen, USA), according to the manufacturer’s instructions. Twenty micrograms of total RNAs were fractionated using 1.2 % denaturing agarose gel electrophoresis and transferred to positively charged nylon membranes (Hybond-N+, Amersham, UK). Hybridization, washing and detection were performed with a digoxigenin (DIG)-labeled DNA probe and a chemiluminescence system, according to the manufacturer’s instructions. The DIG-labeled probe was prepared via PCR amplification with HC-Pro forward (5′-CACGAAGATGGTAAGGGATG-3′) and reverse primer (5′-GGTACCCAACTGTCAAGGAT-3′). The constitutive TUB (5′-TGAGCAGTTCACGGCCATGCT-3′/5′-CTCGGCAGTGGCATCCTGGT-3′) was used as a control of RNA expression. For reverse transcriptase PCR (RT-PCR) analysis of plants and seeds, seed samples were prepared by following the method described by Kim and Ku (2006). Total RNA was isolated using the Plant RNA Purification Reagent (Invitrogen, USA) according to the manufacturer’s instructions. RT-PCR was carried out using Maxime RT-PCR Premix (iNtRon, Korea) according to the manufacturer’s instructions. The primer pairs used in the RT-PCR are presented in Table 1. The constitutive TUB was used as a control of RNA expression. Quantitative real-time PCR (qRT-PCR) was performed in 96-well plates with the CFX-96™Real-Time system (Bio-Rad, Hercules, CA, USA). First-strand cDNA was synthesized using Superscript™ II Reverse Transcriptase (Invitrogen) and oligo-dT (Invitrogen), according to the protocols provided in the user manual. The quantity and quality of the synthesized cDNA were determined via a spectrophotometer. Each reaction contained 3 μL (3 ng μL−1) of cDNA, 0.5 μL (10 pm μL−1) of each primer and 10 μL SYBR®Premix Ex Taq™ (Takara) in a total reaction volume of 20 μL. The PCR conditions were 95 °C for 3 min, 40 cycles of 10 s at 95 °C, 10 s at 55 °C, and 20 s at 72 °C, followed by the generation of a dissociation curve by increasing temperature from 65 °C to 95 °C, to evaluate amplification specificity. The efficiency and standard deviation of each primer were determined by Bio-Rad CFX manager v1. 6. 541. 1028 on a standard curve generated from a twofold dilution series of one sample at five dilution points for two technical replicates. Baseline and threshold cycle (Ct value) were automatically calculated using the default parameters. The primers and probe used in the qRT-PCR are presented in Table 1. The constitutive TUB was used as an internal control to normalize the amount of RNAs found in soybean plants (Hu et al. 2009). NT and transgenic soybean seeds (T3) were planted in seedling tray, and the surfaces of early leaves were inoculated with SMV strain G5. The viral response was evaluated visually so that SMV resistance and susceptibility were classified. NT, SMV-inoculated NT and SMV-inoculated T3 seedlings were then transplanted to large pots and grown in the greenhouse to allow for the evaluation of several agronomic traits, including plant height, number of branches per plant and number of nodes per plant. In addition, the number of pods per plant and the seed weight per plant were also determined to investigate the relative yield of transgenic plants. Statistical analysis was also performed using Excel T Test program to confirm the significance test. Asterisks indicate significant changes compared to NT plants (* P < 0.05; ** P < 0.01). To produce transgenic plants containing HC-Pro using RNAi, the forward partial fragment of HC-Pro (306 bp) of SMV strain G7H was amplified via PCR, then recombined into pB7GWIWG2(I) (Fig. 1). The plasmid, pB7GWIWG2(I)-HC-Pro, was constructed and used for the soybean transformation (Fig. 2). The transformation procedure used half-seed explants of the Korean soybean cultivar Kwangan, and followed the modified protocol described by Kim et al. (2013). Half-seed explants of Korean soybean cultivar Kwangan were co-cultivated on CCM (Fig. 2a, left) for 5 days after inoculation (Fig. 2a, right). To induce the shoot formation, explants were placed on SIM without PPT for 14 days and normal shoot formation was observed in this stage (Fig. 2b). Most of primary shoots became necrotic on SIM including 10 mg l−1 PPT during additional 14 days of culture (Fig. 2c). After 4 weeks on SIM, cotyledons were removed completely, and explants were transferred to fresh SEM with 5 mg l−1 PPT (Fig. 2d). At least 4 cm of elongated shoots was obtained after 4–6 weeks on SEM and transferred to RM for root formation (Fig. 2e). Rooted plantlets were transplanted to the mixture of soil and vermiculite at the rate of 3:1 in small pots and acclimated in magenta jar (Fig. 2f). Transgenic plants (T0) were transplanted to large pots and grown in a greenhouse (Fig. 2g). To test the herbicide resistance, non-transgenic and transgenic plants were used for leaf painting using 100 mg l−1 PPT to test Bar gene expression. After 3–5 days of observation, the leaves of non-transgenic plants were sensitive to PPT and wilted (Fig. 2h, left), whereas transgenic plants were unaffected and resulted in the herbicide resistance (Fig. 2h, right). According to the results of the PPT leaf painting test, about 3 % of transformation efficiency was observed in 5 batches of transformation experiments, and 100–120 soybean seeds were used each time (data not shown). From twenty putative transgenic soybean plants produced, nine healthy and well-growing plants with positive PCR amplifications for four different parts of the T-DNA, as shown in supplementary figure S1, were selected for use in further experiments. To identify transgenic plants into which the gene had successfully introgressed, genomic DNA was isolated from nine plants and analyzed via PCR. To confirm HC-Pro gene insertion, two parts of T-DNAs (between HC-Pro and intron/between intron and HC-Pro) were amplified with PCR and confirmed. As a result, about 600 bp of PCR amplification was detected in all nine transgenic lines. In addition, 550 bp fragment of Bar gene and 836 bp fragment of DNA between the left border (LB) and Bar gene was amplified via the PCR (Supplementary Fig. S1). Southern blot analysis was carried out using leaf samples of T2 seedlings from transgenic lines #1 to #6, to investigate the number of transgene insertions (Fig. 3). The genomic DNA from NT (non-transgenic wild type), EV (transformed with empty vector carrying only Bar) and transgenic plants was isolated and digested using HindIII. After hybridization with Bar probe, low copy of the transgene were detected in lines #1 to #5, probably indicating a single insertion, while multiple insertion events were confirmed in line #6. Quantitative real-time PCR (qRT-PCR) was also performed using the same genomic DNA, to estimate the copy number. As shown in the results of the Southern blot analysis, the copy numbers of all transgenic lines showed similar patterns in the qRT-PCR (Supplementary Fig. S2). To confirm the response of transgenic plants to SMV infection, six T2 lines were planted for inoculation with SMV strain G5 due to no availability of G7H strain at the moment. Wild type and transgenic plants were examined for viral symptoms after SMV inoculation. The coleoptiles of 7-day-old seedlings were inoculated and observed for 4 weeks. To evaluate their resistance against SMV, the viral symptoms were visually evaluated and classified into three subgroups: (1) viral resistance, defined as the absence of symptoms (R); (2) mild mosaic (mM); and (3) mosaic (M). SMV symptoms were observed in the form of light and dark green mosaic patterns and leaf curling on infected leaves. No T2 plants from lines #2, #5 or #6 exhibited any SMV symptoms, indicating the presence of strong viral resistance (R), whereas NT plants and lines #1, #3 and #4 showed mild mosaic (mM) or mosaic (M) symptoms (Fig. 4a). Of the 180 T2 plants that survived the PPT selection, lines #2 (31/31), #5 (35/35) and #6 (37/37) were all highly resistant against SMV. However, all plants from line #3 were susceptible to SMV, showing the lowest resistance of all tested plants. T2 plants from lines #1 and #4 showed 12.2 % (5/41) and 25 % (4/16) resistance, respectively. Considering the positive response of PPT selection, this result may not come from the failure of gene introgression. To verify the heterogeneous response of transgenic plants to SMV infection, the viral HC-Pro accumulation of SMV-inoculated T2 plants was estimated using northern blot analysis (Fig. 4b). Viral RNA accumulation was not detected from three resistant lines (#2, #5 and #6), while NT, EV, and lines #1, #3 and #4 showed viral RNA accumulation when inoculated with SMV. Especially, the leaves of line #1 and #4 were non-mosaic pattern but viral RNA was detected from northern blot analysis. Therefore, line #1 and #4 were classified as SMV-susceptible lines. To confirm the viral RNA accumulation of other potyviral RNA-encoded protein genes in addition to HC-Pro, the presence of coat protein (CP) and CI protein (CI) genes were investigated on SMV-inoculated T2 plants, using reverse transcriptase PCR and quantitative real-time PCR analysis (Fig. 5). As a result, three SMV-resistant lines (#2, #5 and #6) did not show any viral RNA accumulation, whereas SMV-susceptible lines (#1, #3 and #4) accumulated viral RNA. The T3 seeds of SMV-inoculated six T2 plants were harvested and checked for morphological changes due to the viral infection. The viral symptoms of the seeds were classified into subgroups as follows: (1) clear seed (R); (2) weak brown or black mottled seed (mM); and (iii) dark brown or black mottled seed (M) (Fig. 6a). T3 seeds of lines #2, #5 and #6 were clear and seed coat mottling was not present, indicating that seeds were free of SMV infection. The result seemed to come from the resistance of whole plants. Compared to SMV-resistant seeds, the seeds from lines #1, #3 and #4 had brown or black seed coat mottling with greatly reduced number, indicating that they were infected with SMV. The resulting seed morphology clearly showed that the virus did not spread to the seeds in SMV-resistant lines, while the seeds of SMV-susceptible lines were greatly influenced by the viral plants. Artificial viral infection of the susceptible plants led to the transmission of the virus from the leaves to seeds, where seed morphology was affected. The harvested seeds were investigated for viral gene accumulation using potyviral RNA-encoded protein genes, including HC-Pro, CP and CI. Total RNAs were isolated from the T3 seeds of NT, EV, SMV-resistant and SMV-susceptible transgenic plants to confirm the accumulation of viral RNA, using both reverse transcriptase PCR (Fig. 6b) and quantitative real-time PCR (Fig. 6c). Similar accumulation of viral RNA in T2 plants was confirmed using northern blot analysis. T3 seeds from the SMV-resistant lines #2, #5 and #6 did not show any viral RNA accumulation, while the SMV-susceptible lines #1, #3 and #4 revealed the presence of viral RNA, as detected by RT-PCR and quantitative real-time PCR. Among the susceptible lines, line #4 was relatively mild mosaic symptom than other 2 lines (#1 & #3) in terms of viral RNA accumulation and seed morphological change by revealing weak brown mottle. All plants from line #2, #5 and #6 were resistant where no mosaic patterns in leaves and seeds were observed. To investigate the agronomic characteristics of SMV-resistant and SMV-susceptible soybean plants (T3) and compare them to those of NT plants, seeds were planted in seedling trays, and 7-day-old seedlings were inoculated with SMV strain G5 (Fig. 7). Eight plants of NT, SMV-inoculated NT, SMV-resistant transgenic lines (#2, #5 and #6) and SMV-susceptible transgenic line (#3) were transferred to large pots after PPT selection, and observed in the greenhouse for the development of symptoms. T3 plants of SMV-inoculated transgenic lines #2, #5 and #6 were resistant (R), whereas SMV-inoculated NT plants and SMV-susceptible line #3 showed SMV symptoms, such as mosaic patterns with curling leaves and growth retardation (Fig. 7a). Agronomic traits, including plant height, number of nodes per plant, number of branches per plant, number of pods per plant and total seed weight, were examined in NT, SMV-resistant transgenic and SMV-susceptible transgenic plants (Fig. 7b–d). With respect to plant height and seed yield, SMV-resistant lines #5 and #6 were similar to those of NT plants without viral infection, but higher than those of SMV-susceptible plants with statistical significance. In particular, SMV-resistant line #2 exhibited greater average plant height, pod number and total seed weight with statistical significance. The important agronomic traits of SMV-resistant lines #2, #5 and #6 were generally similar to, or more favorable than, those of normal wild type plants, even under strong artificial SMV infection. However, SMV-susceptible line #3 exhibited a significantly lower average plant height and seed yield than NT and SMV-resistant lines (Fig. 7c, d). Agrobacterium-mediated transformation system, based on the cotyledonary-node (CN) method, is widely used for the improvement of soybeans with agriculturally important traits (Hinchee et al. 1988). In spite of our efforts to repeat same condition of transformation method publicly reported, our previous experiment did not produce stable transgenic plants of Korean cultivars (Lee et al. 2006). However, adopting the half-seed method (Paz et al. 2006) with the minor modification of adding thiol compounds successfully produces transgenic Korean soybean cultivars. The main obstacle in producing transgenic plants of Korean cultivars was the severe browning that developed during the early stages of the transformation procedure. Because we hired extra strength of Agro-infection pressure to increase transformation ratio via dipping with high concentration of Agrobacterium solution, and treating with sonication and vacuuming during initial co-cultivation. By adding a thiol compound, such as l-cysteine, dithiothreitol (DTT) and sodium thiosulfate, we could prevent this early enzymatic browning and cell damage. It is well-known that thiol compounds used in co-cultivation increase A. tumefaciens infection and T-DNA transfer by inhibiting the activity of pathogen- and wound-response enzymes such as peroxidases and polyphenol oxidases in the cotyledonary-node region (Olhoft et al. 2003). Considering the results of our previous experiment, it is very clear that adding the thiol compound contributed significantly to the production of successful transgenic plants of the Korean cultivar. In this study, we used a modified half-seed method to transform a Korean cultivar, with a transformation efficiency of about 3 %. This is similar to the efficiency rate reported by Gao et al. (2015), but lower than that of our previous experiment (Kim et al. 2013). A transformation efficiency of about 3 % is not highly efficient, but is enough to produce more than 20 transgenic plants from 500 explant seeds. We believe that 2–30 transgenic plants are enough to study any unknown gene function or test any gene for association with agronomic traits, as was done in our study. Despite using the same transformation protocol, efficiency can change from experiment to experiment. It is more important that a method allows one to consistently obtain successful transformants, regardless of the personal skill of an individual researcher. In that respect, the half-seed method is suitable for use by inexperienced researchers. Wounding one-day-old germinating seeds does not require a complicated procedure or refined techniques. In addition, the half-seed method is less time-consuming. In our previous RNAi-based study of SMV-resistant soybean plants with SMV-CP (Kim et al. 2013), most of the transgenic lines were found to be SMV-susceptible, indicating that a viral protein (HC-Pro) blocks the production of siRNAs to suppress gene silencing by the host plant. Due to its limitation of SMV-CP RNAi for SMV resistance in soybean, HC-Pro was used to produce strong and complete resistance. Recently, Gao et al. (2015) reported results similar to ours, obtained by producing SMV-resistant soybean plants of Chinese cultivars using an HC-Pro gene fragment from SMV SC3 strain via RNAi. One small difference is the presence of viral transcript after the SMV inoculation of transgenic plants; in our study, no accumulation of viral transcript was detected in resistant T2 plants and T3 seeds, via either northern blot analysis or reverse transcriptase PCR and quantitative real-time PCR analysis; however, a gradual decrease or low level of viral transcript accumulation was detected in T1 plants via qRT-PCR during their study. This difference may be the result of using biological materials at different stages and generations, or differences between the plants and seeds used. However, it is very clear that three resistant lines produced during this study were free of viral transcript, even under the sensitive analytic methods used. Among the six transgenic lines tested in this study, three classes of disease response were identified; resistant, mild mosaic and mosaic as susceptible. Northern blot analysis on T2 plants clearly showed the different level of viral RNA accumulation by different disease responses. Level of viral RNA accumulation is well matched with phenotypical disease susceptibility (Fig. 4). The result might come from the positional effect of transgene. It is very common to observe various level of expression of transgene not only in transgenic plants but in animal due to the position effect (Mlynárová et al. 1994; Matzke and Matzke 1998; Halweg et al. 2005). In light of all the evidences, the application of RNAi using HC-Pro seems to confer much stronger viral resistance than any previous method. Clear difference between the major yield components of resistant and susceptible lines in later generations indicates that SMV infection has a significant effect on both plants and seeds. SMV resistance using RNAi can have a huge impact on yield increase or at least the stability of a certain level of yield, by protecting soybeans from severe SMV infection. RNAi is becoming increasingly important to the genetic engineering of plants for crop improvement. Though it was only discovered recently, it functions as a basic mechanism of gene regulation in higher organisms, including plants. During various cellular procedures, a plant requires a method of decreasing gene expression for a number of reasons, such as defense against the viral invasion of a plant cell. In terms of genetic engineering, it is interesting to note that we have long used RNAi to create new agronomic or industrial traits, though unknowingly (Jagtap et al. 2011; Frizzi and Huang 2010). More and more genetically engineered crops produced using RNAi are being registered by global companies with special traits ranging from virus resistance to quality control. The RNAi of plant endogenous genes is very useful for changing a plant’s oil composition to improve its fatty acid profile, reducing lignin for better quality, decreasing the potential for harmful chemicals to form during food processing, and reducing susceptibility to bruising (https://www.aphis.usda.gov/aphis/home). In this study, we could produce transgenic soybean lines with viral resistance via the RNAi of HC-Pro. This is much consolidated result than the previous report. In future work, an extensive field test is scheduled to take place, which will test these transgenic plants under natural conditions of SMV occurrence. This work was supported by the Next-Generation BioGreen 21 Program (Code PJ011150), Rural Development Administration, and Korea Institute of Planning and Evaluation for Technology in Food, Agriculture, Forestry and Fisheries (Code 112124-5), Republic of Korea.